Any remaining market uncertainty following last year’s series of events that combined to cause a distinct slowdown in real estate sales seems to have dissipated. 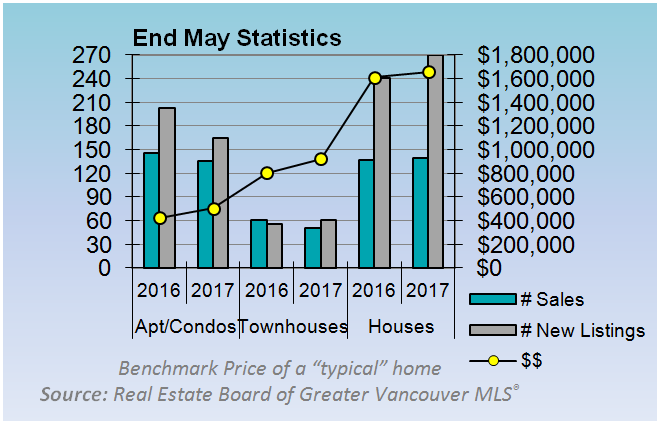 May home sales in Metro Vancouver were the 3rd highest on record for May, a full 23.7% above the 10-year average for the month. One key indicator of activity and trends is the ratio of home sales to the total number of listings available for sale. A rule of thumb is that if this ratio holds at or above 20%, there will be upward pressure on prices. A 20% sales-to-listings ratio means that 20% of the homes available for sale in a given month were sold. It’s not surprising given that sort of sales pressure that condos are often seeing multiple offers, and prices for all categories of housing are continuing to increase. Call me when you need more detailed market information, so you can make the best decisions about your housing needs. Benchmark price of a “typical” home. Here we are a year after the 2016 market peak – before it started to cool last summer, before the Foreign Buyer’s tax, before the mortgage rule changes. Benchmark Prices for all types of homes are higher than a year ago, and the number of sales almost matching last spring’s pace. Most REALTORS® feel that the number of sales would be even higher if there were more homes available for sale.